Offers: Open Fairways card; 2fore1 vouchers; Plus club discount schemes - contact professional for details. 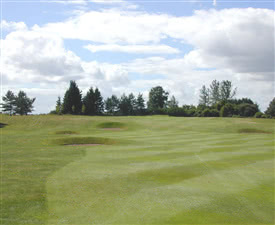 Edzell Golf Club lies at the gateway to the Grampians in the foothills of the Angus Glens. Indeed the mountains form a backdrop to this lovely heathland/parkland course. The course is located in the beautiful village of Edzell, midway between the cities of Dundee and Aberdeen. The original course was laid out in 1895 by Bob Simpson, top golf course architect of his day. In 1933/34 the course was re-designed on recommendations made by the famous James Braid and remains virtually unchanged to this day. Today the course is situated in some 128 acres and has been complemented with the addition of the 9 hole West Water course in 2001. In Golf Monthly - June 1999 - the course was considered to have no weaknesses and that "golfers visiting the Angus area can't afford to miss what is one of Scotland's true hidden gems". It was also specifically featured in the video - Hidden Gems - narrated by Peter Alliss.